The state transport department allocated six buses to help in the evacuation of the 300 passengers who were onboard. The official added that the around 24-36 hours will be required to clear the site. 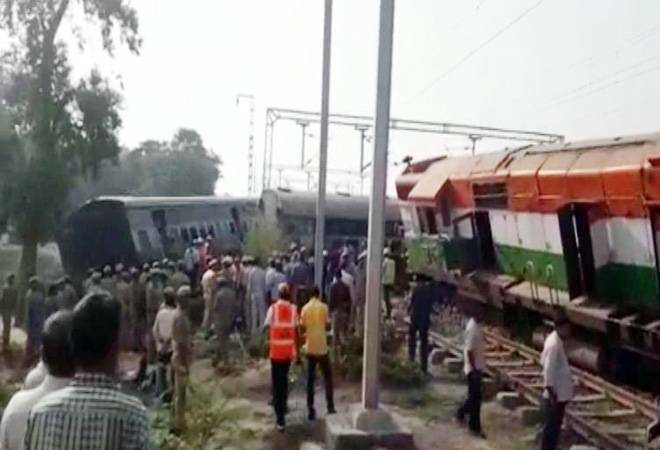 Nine coaches and engine of the New Farakka Express (14003) got derailed near Rae Bareli in Uttar Pradesh in the early hours of Wednesday. At least seven people were killed and nine severely injured during the accident, Additional Director General (ADG), Law and Order, Anand Kumar said. The accident took place in Harchandpur area of the district at 6:10 am, injuring around 35 people. The injured are being taken to the Harchandpur PHC and district hospital. A National Disaster Response Force (NDRF) team comprising 40 personnel reached the accident site. Drones are being used to monitor the situation at the accident site. Senior officers, including the district magistrate, superintendent of police, CO, sub-divisional magistrate are at the spot and relief operations are in full swing, the ADG said. The Divisional Railway Manager of Northern Railways said that all passengers have been evacuated. The state transport department allocated six buses to help in the evacuation of the 300 passengers who were onboard. The official added that the around 24-36 hours will be required to clear the site. All up and down lines on the route have been blocked and officials suspect that the number of casualties may rise. The passengers are being sent to Lucknow and from there they will be sent to Delhi by a special train, officials said. Emergency helpline numbers have been set up at the Deen Dayal Upadhyaya junction, Mughalsarai, officials said. The ADG said that the reason for derailment will be known after an Anti-Terrorism Squad is sent for an on-the-spot probe. Railway Minister Piyush Goyal has ordered the Commission of Railway Safety, Northern Circle to undertake an enquiry into the accident. The minister has been in constant touch with the railway administration and has directed to effectively undertake relief and rescue operation and provide best possible medical help to the injured, the officials said. "I offer my deepest condolences to the families of the deceased and those injured in the accident near Rae Bareli. I am in touch with officials for relief work. Railways will offer compensation of Rs 5 lakh for the kin of the dead in UP accident, Rs 1 lakh for the injured and RS 50k for those with minor injuries," Goyal tweeted. The chief minister also expressed his condolences for the deceased and directed the Director General of Police to take all necessary action. CM Adityanath also announced Rs 2 lakh compensation for the family of the deceased and Rs 50,000 for those who are seriously injured. Prime Minister Narendra Modi also expressed his condolences at the loss of lives in the train derailment. "Anguished by the loss of lives due to a rail accident in Raebareli. Condolences to the bereaved families and I pray that the injured recover quickly. UP Government, Railways and NDRF are ensuring all possible assistance at the site of the accident," he tweeted.